One of our long-time favorite summer dessert recipes is Marmalade Cake. 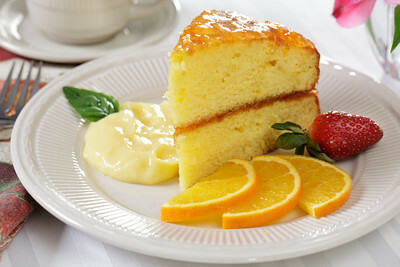 It’s a lovely orange flavored golden cake, topped with orange marmalade and served with fresh sliced berries and whipped cream on the side. Earlier this week we had this cake made and on the menu for dinner but had a last-minute request from a guest for “something chocolate” for dessert. So my husband Ian came up with the brilliant idea to top the marmalade cake with a chocolate icing. Oh my. It was heavenly. It reminded me of the little English cookies called Jaffa Cakes, so I decided to give the chocolate version that title. This recipe will give THREE cakes, each of which will serve up to 10 people. If you don’t need that much, you can bake the cakes and freeze the extras until needed. Simply thaw the cake, glaze, and top with marmalade and chocolate icing. You can also half the recipe and bake in two 8 inch cake pans or in a 9 x 13 pan. The chocolate icing recipe is enough for three cakes. If you only use one cake at a time you can make the entire icing recipe, then refrigerate the unused portion until needed. Carefully reheat in the microwave until it reaches pourable consistency. This icing is closer to a ganache than a spreadable icing – you simply drizzle it over the cake and allow it to spread evenly. Preheat oven to 350. Take three 9 inch cake pans and grease with oil or cooking spray and dust lightly with flour. In a large bowl, beat cake mixes, eggs, melted butter, orange juice and orange rind on medium speed of a mixer for about 3 minutes. Divide batter between the three pans. Bake for about 30 minutes, or until cakes test done. Cool in pan for about 15 minutes before removing to a plate. Combine the 1/4 cup of orange juice with 1/4 cup of sugar in a microwave safe bowl or jug and heat on high, stirring occasionally for about a minute, or until sugar completely dissolves. Brush this glaze over cakes. Warm the marmalade slightly to make it easier to spread. Spread 1/3 of the marmalade evenly over the top of each cake. Refrigerate until ready to serve. Cake can be enjoyed with whipped cream and fresh berries, or if desired, topped with chocolate icing. Place sugar, butter and milk in a medium saucepan over medium heat. Stir until it reaches a boil. Keep stirring until sugar dissolves. (about 30 seconds). Remove from heat and stir in chocolate chips. Immediately pour over cake, allowing a little to drip down sides. Refrigerate until firm.